The Brew Lounge: Big-time Homebrewing in Portland, Ore. Big-time Homebrewing in Portland, Ore.
As amazing as the growth in commercial craft brewing over the last 10-20 years, the phenomenal growth in homebrewing is equally impressive. 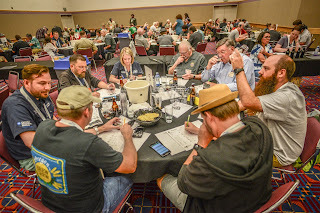 I'll let the recent press release from the American Homebrewers Association tell the story from Portland, Ore. where the annual National Homebrewers Conference & Competition took place. Portland, Ore • June 30, 2018 — Over 3,200 homebrewers and beer enthusiasts gathered at the 40th Annual Homebrew Con presented by the American Homebrewers Association® (AHA) this weekend at the Oregon Convention Center, where they attended seminars, bonded over brews and had their beers judged in the world’s largest beer competition. 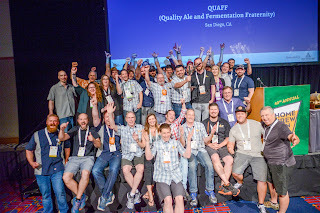 Beer lovers and anyone interested in making their own beer are invited to learn more at HomebrewersAssociation.org. Follow the AHA on Twitter, and join us on Facebook and Instagram. Philly Beer Week 2018. Complete.